We race Sunfish every Sunday afternoon from late May through mid October and the official schedule is posted on our calendar. We welcome beginning racers and competitive racers. Everyone is extremely helpful to get newbies up to speed. We conduct racing workshops on beach a few time througout the summer to review everything from rigging to rules. And after racing refreshments add to a welcoming social atmosphere. We break the season into two racing series - a summer series with the last race on Labor Day, and a Fall series through mid October. We also host regattas for local midwest sailors, and also every year or two we host additional regattas - Regional regattas, North American Sunfish Championship, North American Women's Championship, and more.. Races shall be governed by the rules and prescriptions in effect for that year as defined in The Racing Rules of Sailing, the prescriptions of the United States Sailing Association (collectively referred to as The Racing Rules of Sailing) and the U.S. Sunfish Class Association class measurement rules (except as any of these are altered by local sailing instructions) and by these sailing instructions. Club members may enter any regularly scheduled race. Guest sailors may sail with the permission of the race director or other club official. Guest sailors will not be scored. Boats used in racing shall comply with U. S. Sunfish Class Association measurement rules. 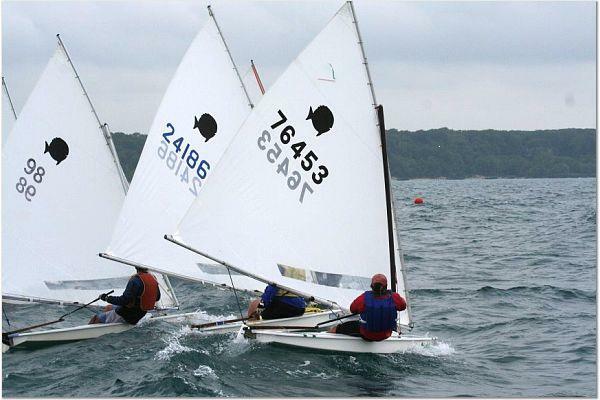 Sails used in racing may be either U. S. Sunfish Class Association approved sails or sails that are similar in size and cut provided such non Class approved sails do not provide an unfair advantage to the boat being sailed. All boats being sailed in Sunfish Class Association sponsored events, such as Regional championships, shall use Class approved sails. Notices will be posted on the Race Notice Board located at the club boat compound at Lake Bluff beach. Any changes in the sailing instructions or race schedule will be approved by the Race Committee and posted before Noon on the day it will take effect. Summer Series: Races are scheduled every Sunday afternoon beginning in late May, as determined by the Club’s calendar for that year, continuing thru Labor Day weekend and ending with the Commodore’s Cup Race on Labor Day. Fall Series: Races begin the Sunday after Labor Day through Late October, as determined by the Club’s calendar for that year. Start time: All races begin promptly at 1:30 PM. All races will be on Lake Michigan in an area adjacent to the Lake Bluff beach, which, in the judgment of the Race Committee, will allow for fair sailing conditions. 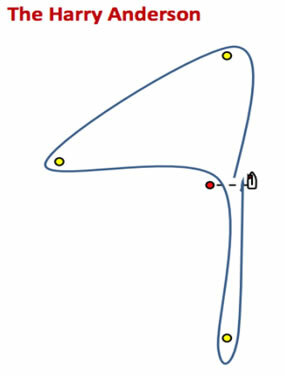 The descriptions below show the courses the approximate angle between legs, the order of rounding marks, and the side on which each rounded mark is to be passed. 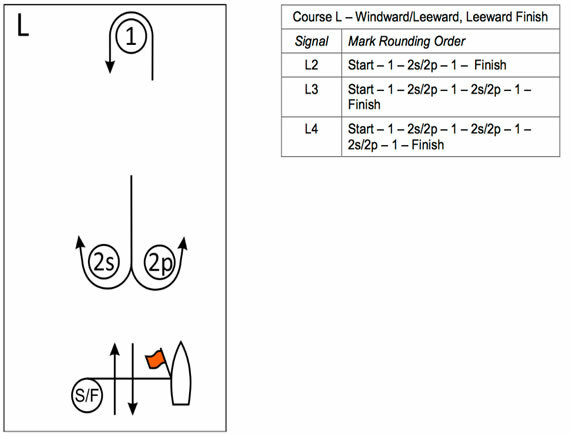 In addition, the Race Committee may utilize windward offset marks and leeward gates at their discretion. Other courses may be established by verbal instructions from the race committee, by combining elements of the above courses. For example, “Windward/Leeward one and one-half, finish on a run”. Sailors are instructed to sail close by the race committee prior to the starting sequence to receive instructions. The Race Committee may, in its discretion, establish other courses to be sailed on a particular day, but may do so only after notifying all racers in a skipper’s meeting prior to launch. Marks will be the Club’s racing buoy marks, which may be either round red buoys or orange tetrahedrons. The starting and finishing marks are described in instruction 9. - "The Start", and instruction 11. - "The Finish". Races will be started in accordance with Racing Rule 26 in The Racing Rules of Sailing (standard 5 minute start sequence). At its discretion, and provided all racers for that day have been notified, the Race Committee may use “Appendix U – Audible-Signal Racing System” to start races (three minute dinghy start system). The starting line will be between a staff displaying a flag on the race committee boat at the starboard end and a round orange buoy at the port end. The finish line will be between a staff displaying a flag on the committee boat at one end and the starting buoy at the opposite end. If for any reason (safety or otherwise) the committee boat is off station at the finishing line, the first three finishers will keep track of the finishing position of subsequent boats in the race. The time limit for each race shall be one hour from the starting signal. If no boat reaches the first mark within 30 minutes after her starting signal, the race shall be abandoned. Boats not finishing within the time limit will be scored "did not finish - DNF". If no competitor has crossed the starting line within 5 minutes of the starting signal, the race will be abandoned. No race will start after 4:00 PM unless otherwise instructed by the race officer. No race in which there are fewer than 4 participants that start the race will count in the series standings. The race committee or officer in charge can postpone or abandon any race if, in their judgment, conditions warrant such action. The committee boat and safety boats shall render assistance to any boat or sailor needing help. All sailors shall be guided by Fundamental Rule 1 - Safety of The Racing Rules of Sailing regarding helping boats in danger and life-saving equipment. In addition, LBYC requires competitors and the Race Committee to wear life-jackets at all times. A.) Each boat finishing a race and not thereafter retiring or being disqualified, or being granted redress under The Racing Rules of Sailing, shall score points equal to her finishing position. B.) For boats that did not start, did not finish, retired, were disqualified, or did not come to the starting area shall be scored as specified in The Racing Rules of Sailing, Scoring, Appendix A, paragraph A9 "RACE SCORES IN A SERIES LONGER THAN A REGATTA". C.) Any member who participates in a sanctioned Sunfish racing event as a representative of the Lake Bluff Yacht Club that causes that member to be absent from Lake Bluff on the day of a series race, may, upon application with a member of the Race Committee, be given special consideration in scoring. Such member shall be scored at the average of his races sailed in the series, defined as follows: either i.) the average of all his LBYC races sailed in that series prior to his absence, or ii.) the average of the first five LBYC races sailed in that series, whichever is the most races. For the Summer Series, a maximum of 5 races may be scored in this manner. For the Fall Series, a maximum of 3 races may be scored in this manner, provided the Fall Series is 20 races or more. This system will not be used for the Fall Series if there are less than 20 races sailed in the Fall Series. D.) Any member who participates in a sanctioned Lake Bluff Yacht Club sailing regatta or a sanctioned Sunfish racing event as either the regatta chair or as a member of the regatta race committee and such duties cause the member to be unable to race in such regatta, may, upon application with a member of the Race Committee, be given special consideration in scoring. The scoring, computation of averages, and limitations on use of this scoring method shall be the same as for racers contained in paragraph 15 C) above. E.) To qualify for final standings in the series, a sailor must race in at least 30% of the total series races sailed. F.) The best 60% of the total races for each racer during the series will be counted to determine the final standings, (40% throw-outs). A two turns penalty for an infringement of racing rules and a one turn penalty for touching a mark. Protested boats must be informed at the time of the rule infraction. A.) Protests shall be written and lodged with a representative of the Race Committee after the last race of the day and within one hour after the time of the last boat's arrival at the beach. B.) The protest committee shall hear protests in approximately the order of receipt beginning as soon as practical after racing or as they may otherwise inform the parties involved..
C.) If, in the judgment of the protest committee, they find it unsuitable to judge the protests immediately after the conclusion of racing, the protest committee will reschedule the protest hearing to a later time, but no later than prior to the next series race. D.) Decisions of the protest committee will be final.